Brand new carpet comes with a protective layer which was applied at the mill where it was manufactured. With regular foot traffic this protective layer begins to wear off. Your carpet probably gets more wear and tear than anything else in your home, and once the protection has worn off the carpet starts to wear making the fibers more porous and damaged. As the fibers become scratched and porous it is a lot easier for dirt to become attached, making it harder to remove with regular vacuuming. 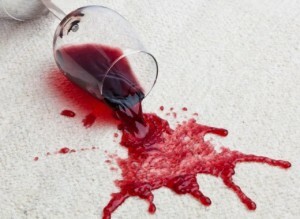 It also make it easier for spills to set in and stain. Scotchgard is a coating that is applied after cleaning, acting as a sealer that coats the carpet fibers and fills in the porous areas. Scotchgard works the same way as that original protective coating from the mill, creating a barrier that helps prevent soil from attaching to the carpet fibers. This means that everyday vacuuming will be much more effective, and it will make it easier to keep your carpet cleaner which prolongs the life of your carpet. Spills will also be much more easily cleaned up before soaking in. The invisible layer will help keep the spill on the surface, giving you time to soak it up before is soaks into the fibers. We highly recommend scotchgarding your carpet after using our carpet cleaning services, especially to homes that get a lot of traffic or have kids and pets. Scotchgard Your Upholstered Furniture Too! We also recommend having Scotchgard applied to your furniture after using our upholstery cleaning service. Scotchgard works the same way when applied to furniture as it does with carpet, sealing the fibers making it harder for dirt and stains to attach to the fabric and giving you more time to soak up spills. This will help keep your furniture cleaner longer and looking new. Get a scotchgarding quote here!